Randy Smyth is well known to the sailing crowd. He's graced the cover of no less than five sailing magazines. As skipper for Kevin Cosner in Water World, and Pierce Brosnen in The Thomas Crown Affair, Randy's unique sailing expertise is in hot demand. Randy is sought by Olympic teams for his world renown skills as technical coach. 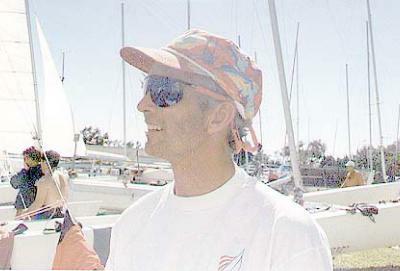 Winning the America's Cup in 1988, Randy's contributions included teaching Dennis Conner the fine points of sailing catamarans. Randy's world dominance in multihull sailing has been a function of his lifelong focus on excellence. From the Olympics to World Championships to Grand Prix Circuits in Europe to 1000-mile Beach Catamaran Races, he's won race after race after race. 55 National, Continental and World Championship wins. 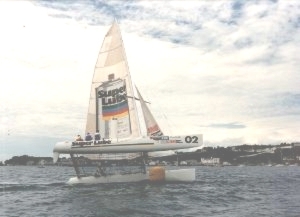 First multihull sailor to ever receive the award. By the Southland Corporation (the first time awarded in Yachting). By the Southern California Yachting Association (only awarded once before). 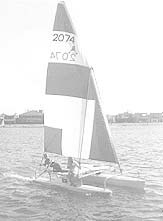 In addition to his sailing and racing, he currently has a sailmaking business, The Smyth Team Sails, which he operates at his home port in Fort Walton Beach, Florida.